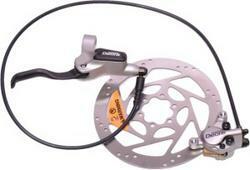 I'm having a lot of trouble with my current disc brakes. Right now, im trying to get the pistons re-aligned (centered), as it seems the outboard side on my rear caliper is out much farther than my imboard one. Now, when i go to squeeze the brake lever, the pads still push in unevenly (more towards the outboard side). After examining the pad block, it seems like the outer arm that you use to install/remove it is keeping them from moving in evenly. After doing this twice, i reset the pistons for a 3rd time, but instead of using the red pad block, i used an actual rotor instead. The pads seem to both move in an equal amount, though i have yet to actually test it with the rotor on my wheel. Also, I'm having trouble with using shims to adjust the caliper position. It seems like such a poor system, the shims either just mushroom out or slide around when i ride my bike, and often don't even get the caliper properly aligned (parallel) to the rotor, even with faced disc tabs. Is there an alternative to the shims? tl;dr version would be: Pad spacing block does not properly set the pistons to their initial positions, it sets them off center - what gives? I'm not sure what you mean - in this diagram, #30 is the spacer. So you are tyring to center the disc caliper on the disk post (tab) with this instead of centering with an actual rotor with the wheel on the dropout? I'm most certainly misunderstanding you but I always center the caliper when the brake and the wheel is on the bike. Loosen the caliper, eye ball even spaces between R/L pads. Or simply squeeez brake lever to firmly hold the caliper and tighten the bolts. You don't do this? I use spacer only when I do maintenance or transport bike without wheels installed. I'm not sure what you mean - in this diagram, #30 is the spacer. So you are tyring to center the disc caliper on the disk post (tab) with this instead of centering with an actual rotor with the wheel on the dropout? Yes, this is what I'm trying to do, but only because that's what the instructions are telling me to do. After resetting the pistons and installing the pads, it says to insert the pad spacer and press the brake lever several times in order to get the pads to their "initial position". Then you install the wheel and use the shims to line up the rotor and caliper. I just watched a video for setting up new XT disc brakes, and they also use this method for setting the pistons initial position, so i would have to guess this was the norm for most of shimano's stuff. I also have only ever used the red block for transporting my bike with a roof rack, or when I've got a wheel out and am working on the bike. I was having some brake issues recently and I decided to reset the pistons, and that's when this issue came up. Take a look at the videos on Hope's tech. page (link). They explain caliper installation and pad/piston centralisation pretty well. The principle is the same for your brakes, you may just need to find a slightly different way of applying the knowledge. That's a nice video. I did end up getting my pads aligned with my own method, but i would say the question of why the red pad block, which is designed to align the pistons properly, isn't working. Doesn't really matter now, but I would like to know anyways. I wouldn't call it a defect, but it could as well be that the lesser series components are made with less precision. It could be that one of the pistons more friction that drags, or maybe one side of the fluid line in the caliper is smaller than the other... It should not, but it could happen.